Click on the image above and fill out our sign-up form, or call Blue Terra Energy today! 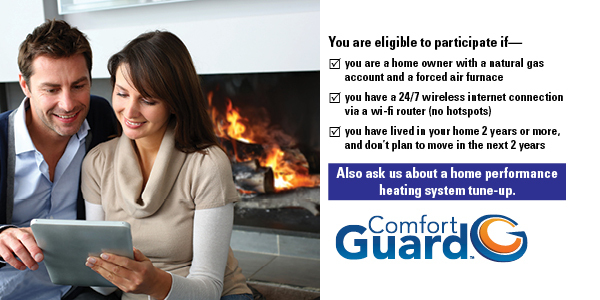 Blue Terra Energy is excited to offer the Comfort Guard system to natural gas customers. Comfort Guard is a revolutionary system that monitors your home HVAC unit for performance, then sends information to your smart phone or smart device to alert you of any malfunction or performance issue. This system is being offered completely free to the consumer as part of a pilot program from Efficiency United.